After effects is a digital visual effects & motion graphics application developed by Adobe Systems and used in the post-production process of film making and television production. Among other things, After Effects can be used for keying, tracking, compositing and animation. Where is everything in After Effects? Project Panel: Stores all of your media data & files. It is Located to the top left of screen interface. It provides basic information about your media files. Composition Panel: Serves as a monitor to view all media files & preview of project timeline. Render Queue Panel: Here is where you are able to view layers & rendering of your composition elements. Placing files in numerical order is very critical for viewing them in the composition panel. Timeline: This is where your composition & project elements are all laid out to manipulate for final product. You can import footage by either double clicking the Project panel area or click File > Import > File or Multiple files. Clicking & dragging from the Finder is also available for use. How to Create A New Composition? Always create a new (Video) composition first before adding any other items. You can either click & drag media clip(s) down to the composition icon & it will set composition based current footage settings. Also you may click Composition at the top of the screen—à New Composition. Pulling Images & files into timeline? Select image and/or files in project panel box then drag onto composition in comp panel. If you drag it on the composition video window you may choose “where” to place it, if dragged to the timeline you may choose “when” to place it. Add special effect to a composition? Look into special effects menu panel located to the top right side of interface. A vast list of special effects options will be available. Select by double clicking, allow a bit of time for render (depending on which effect) & view it in timeline. Adobe’s Creative Cloud (formerly known as Creative Suite) is a collection of software for multimedia production, with Photoshop being its most well-known, flagship program. Below is some information and links to basic instructions on three Adobe products. Adobe Photoshop is a powerful software program used by everyone from hobbyists to industry professionals to edit, touch up, alter, and experiment with photos. Adobe Illustrator is a drawing program that can be used for a variety of design and layout projects like fliers and posters. Adobe Premiere Pro is a video editing program that will allow you to load and edit video clips and add animations, effects, captions, and music. The Technology Design Studio (TDS) is frequented by students with ambition and stellar work ethic. Clark Atlanta University seniors, Jasmine Cungious and Tamara Bennet are examples of how our students take advantage of the software available in the TDS area. A member of the team sat down with the Fashion Design majors for a brief Q&A. 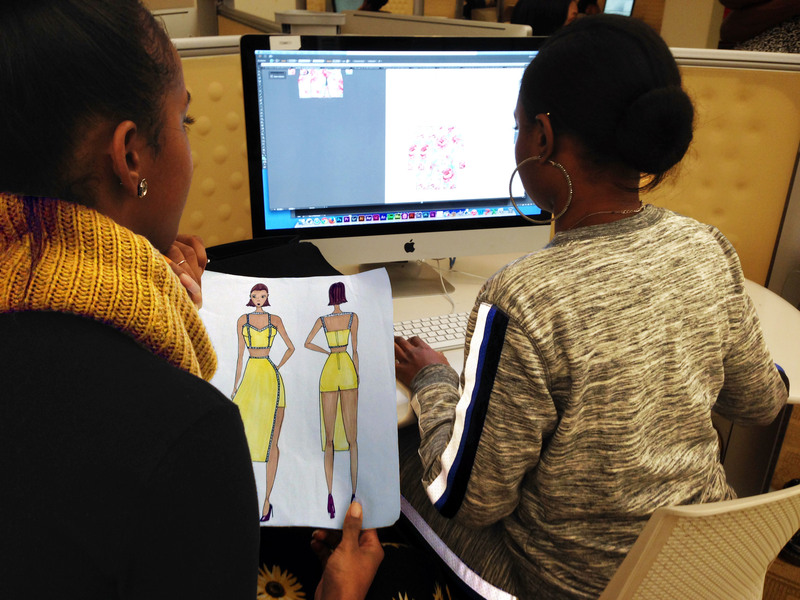 Jasmine Cungious (left) and Tamara Bennet (right) working in the Technology Design Studio. How did you learn about the resources available in the Technology Design Studio? Jasmine: I just saw the Mac computers and noticed we had all the utilities on there. Tamara: Same here. Our department offers Mac computers where they have these programs on it, but after hours we come here and use the computers. What are you working on and which applications do you use? Tamara: Right now we’re working on a Fashion CAD project. Basically, we’re creating flats of designs that we have sketched out on our own. We have to work with it in Photoshop and Illustrator and make it come to life. You put color in it, patterns in it. You just make it look real, you know? Jasmine: It’s a version of it lying down almost, rather than it on a figure. After this we’ll go in and mark how many inches it would be to the collar and neckline. This would be a spec sheet that someone takes to actually create it at a warehouse. Tamara: I want to work with men’s wear and work with a company called Suit Supply. I want to work here for a while and possibly transfer to LA. They work with men’s tailoring and men’s suits, and I’m obsessed with all of that! Jasmine: I’ll probably go to graduate school at SCAD. The Technology Design Studio lab is open during regular library hours and currently has the Adobe CC master collection. All applications are available to students, faculty, and staff with a remote access account. ELT wishes Jasmine and Tamara much success on their future endeavors. Who knows, maybe the world will wear a design created right here in the Technology Design Studio. Duolingo is a free science-based language education platform created by Luis von Ahn, PhD, and Severin Hacker, PhD. Apple selected it as iPhone App of the Year 2013, Google, as Best of the Best for Android in 2013 and 2014, and TechCrunch dubbed it, Best Education Startup. 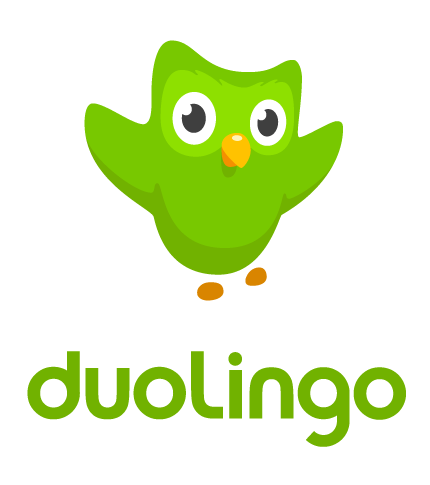 In a recent independent study, professors from the City University of New York (CUNY) and the University of South Carolina found that when using Duolingo for 34 hours, students learn the equivalent of one university semester of language instruction. (https://www.duolingo.com/press). Check out this app that we’ve recently discovered. PhotoMath reads and solves mathematical problems using your device’s camera in real time. Watch the video. Jeff sits down with Scott and Jenny from Swivl to learn how teachers can create dynamic flipped lessons using their mobile devices and Swivl!